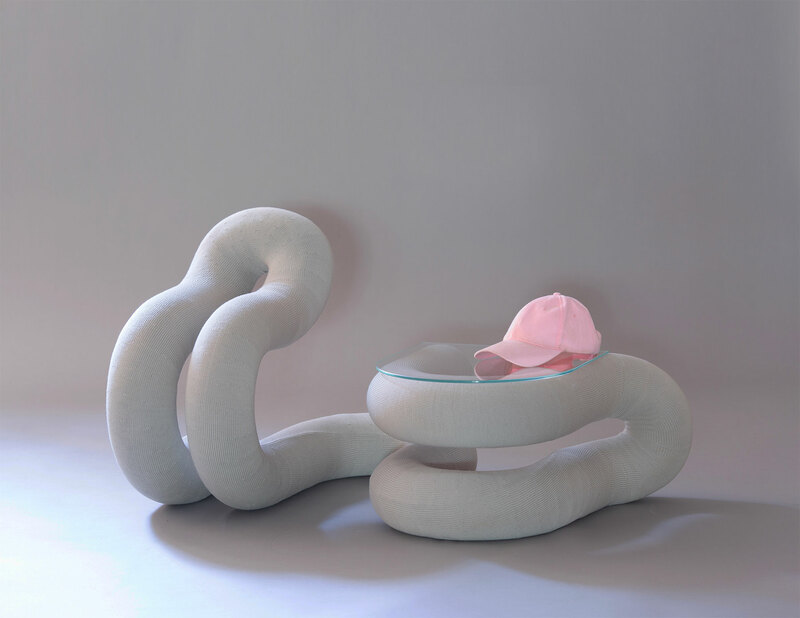 On the heels of the Architectural Digest Design Show, where he debuted a tubular series under his new brand Soft Limits, the Cranbrook alum riffs on his uniquely choreographic approach to making furniture fun again. Soft Limits is at once refreshingly playful and deliriously inventive—much like Thorose himself. Studio location: Uprooted from Detroit and considering either Los Angeles or New York. Describe what you make: I conduct lab-based material investigations that often result in objects. Or, I make furniture. The most important thing you’ve designed to date: I’ve developed a form language called Soft Cylinders. Essentially, I take a line and subvert it. It’s the product of explorations in material, form and movement––the feeling of mechanical movement versus body movement. I start with a CNC-style movement, let it slip into a curious lilt, and then pull it back. There’s an inhale-exhale of control, release, and then control. The dead precision of the mechanical sets a context for imprecision to feel alive. I think of each form as a phrase written in body language. It’s choreography set to form. I use cylinders that are approximately the circumference of an adult human thigh, so there’s something sympathetic but still abstract about the forms. Describe the problem your work solves: My work doesn’t solve a problem as much as playfully acknowledge that we’re living in one. Describe the project you are working on now: I just started a brand called Soft Limits. It’s a home for my consumer products. 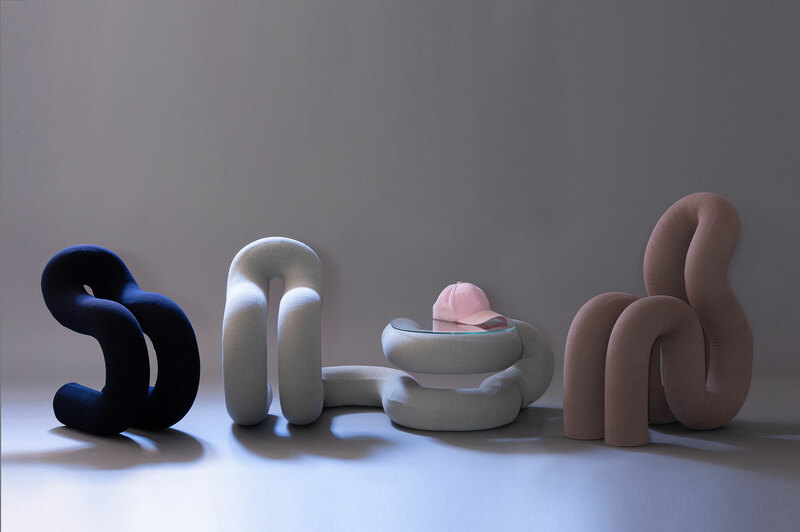 I debuted it at the Architectural Digest Design Show last week with the Soft Cylinders collection. 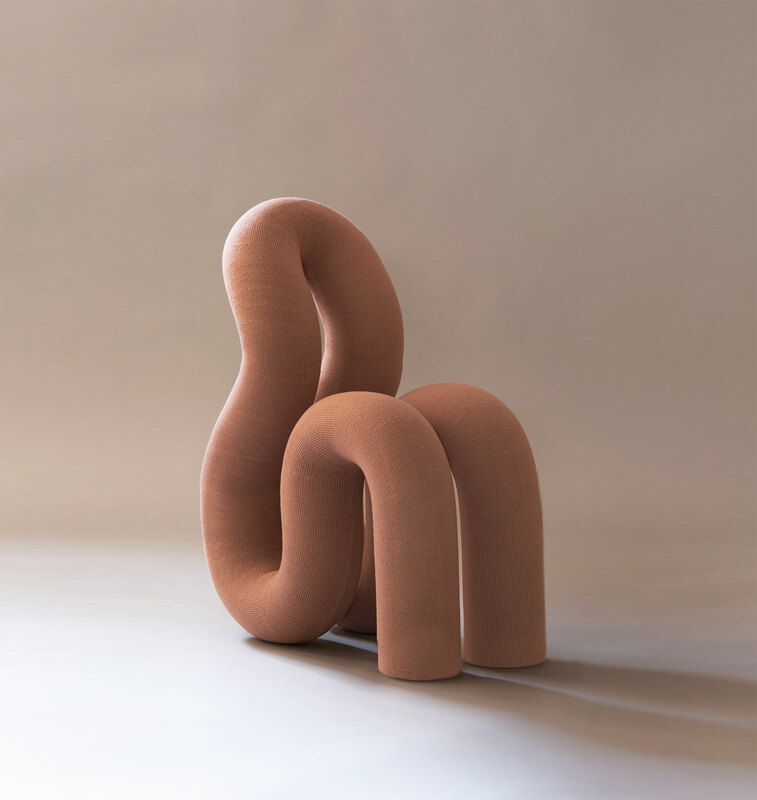 This work is upholstered furniture deriving from rubber tubular work. I wanted to produce a version of the forms I’ve been working on for two years but with a new, warmer feeling––something that lives in contrast to this dark national moment––that could be accessible to a wider public. I’m excited for the Soft Limits releases coming later this year, which will include collaborations with other artists and designers. A new or forthcoming project we should know about: I’m working on a new rubber tubular chair for an exhibition next month. That’s all I can say right now. What you absolutely must have in your studio: I need a soundtrack. It used to be music, but lately I’m drawn to podcasts––mostly queens in long conversations about the drag world. I spend a lot of time alone in the studio so it’s comforting to have familiar voices chattering while I work. What you do when you’re not working: I collect things. I love objects of certain scales, like things that fit in my palm or that are about the size of a baby. I’m drawn to rare or unusual colors, design from outdated technologies, raw materials, things from nature, or frankly, just things with allure. They become my totems. I have regular sources but I’m always out for new ones. It’s my research so I don’t consider it work, but it’s definitely part of work. I guess that means I’m always working. Sources of creative envy: There’s admiration. Alvar Aalto and Artek. There’s this beautiful negotiation between modernism and naturism. The distraction you want to eliminate: I’m leaving Detroit in search of many things, among them distractions. Please, distract me. Concrete or marble? Marbles, if I may. High-rise or townhouse? No flat answer here. Remember or forget? Remember, and then forget. Aliens or ghosts? Ghosts. At least they’re human. Dark or light? Can’t have one without the other.